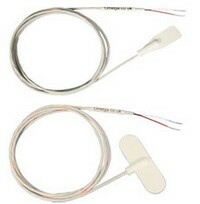 A selection of resistance thermometers for measuring surface temperatures in the range -50 - 200°C. These Platinum Resistance Temperture Sensors (PRT's) are available in 2 different mounting styles for flat or curved surfaces. The integral 4-wire RTD sensor is bonded onto the inner surface of the self adhesive aluminium foil strip, which is provided for faster response times. PFA Insulated IEC colour coded cables. Wire: 7 x 0.16mm stranded RTD lead wire, 1 m, 2 m and 3 m standard lengths.